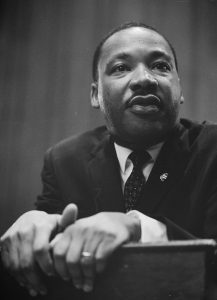 Today, we commemorate the 50th anniversary of Dr. Martin Luther King, Jr.’s death: his assassination by James Earl Ray in Memphis, Tennessee, where King was preparing to march on behalf of sanitation workers on strike. In marking this tragic anniversary, we also celebrate the U.S. Civil Rights Movement King did so much to advance. Indeed, most 21st-century Americans see King as a national hero; we regard his writings, speeches, and sermons as key documents of the expanding American experiment, and we honor his memory through monuments, parks, schools, a holiday, and the names of our boulevards. As much as King has become an American champion and even a legend, we should also—and especially on this day—recall the international scope of his vision: how King’s notion of “the beloved community” grew to encompass all the people of the world. King drew on a variety of religious and philosophical sources as he developed the basic tenets of this philosophy. The non-aggression principle of ahimsa, as popularized by Mahatma Gandhi, is the best known of these sources, as outlined in King’s 1959 Sermon on Gandhi. He also benefitted from the ideas of the Fellowship of Reconciliation, an international interfaith group founded in 1914 in an attempt to prevent World War I; the U.S. chapter was attended by Josiah Royce, a theologian and philosopher who first articulated the idea of the beloved community. (Royce received one of the first doctorate degrees granted by Johns Hopkins in 1878. We have some of his early writings in the University Archives.) Over the years, King’s description of the ideals and practices of nonviolent resistance grew more specific, as he and his brother and sister activists sought to implement it in their arduous and dangerous work. In April 1957, when he gave his sermon on “The Birth of a New Nation,” King’s beloved community was explicitly global. In this speech, celebrating Ghana’s successful fight for independence from British colonialism, he connected that struggle to the Indian independence movement and the U.S. struggle against segregation—and he invoked again the goal of a beloved community that leaves no one out. King’s view of the beloved community also clearly embraces migrants to and from all nations. 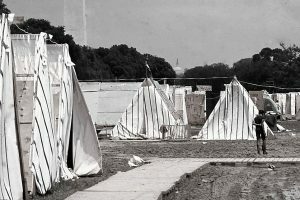 In a 1966 note to Cesar Chavez, leading farmworkers who were largely undocumented, King said, “Our separate struggles are really one—a struggle for freedom, for dignity and for humanity.” And in his 1963 “Letter from Birmingham Jail,” a response to local clergy who objected to “outsiders coming in,” he issued perhaps his most eloquent defense of the beloved community as a global phenomenon: “Injustice anywhere is a threat to justice everywhere. We are caught in an inescapable network of mutuality, tied in a single garment of destiny. Whatever affects one directly, affects all indirectly.” His murder interrupted the launch of the Poor People’s Campaign, a multi-pronged crusade against U.S. poverty through policies to provide jobs, unemployment insurance, a fair minimum wage, and improved opportunities for education that was organized by over fifty multiracial organizations. While its immediate goals were national, its premise was transnational—a recognition that poverty at home was linked to economic and political power dynamics that created wealth and poverty everywhere. Remembering Reverend Martin Luther King, Jr.